Welcome to TGIFF! This has been the first week back to work and school for us and it has made the week feel like it has flown by at super speed. Here are the boys on their first day of school. 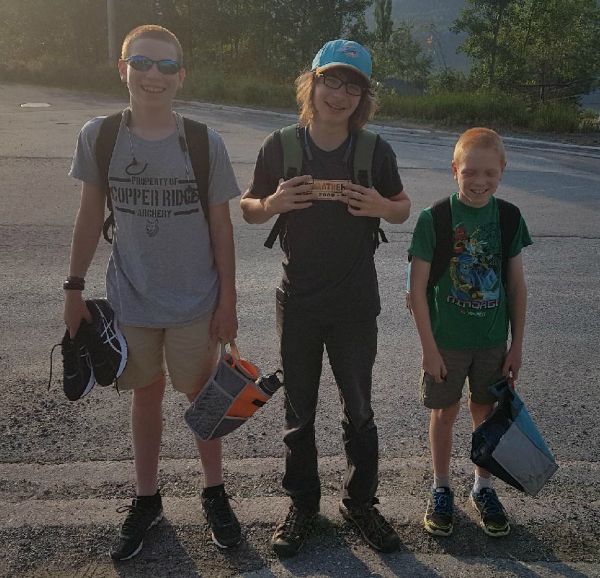 Zach is now in grade 8, Aiden is in grade 10 (senior high!) and Nathan is in grade 4. Back in early December I made a throw quilt for Quilty magazine in 9 days. 9! It was crazy, considering I was also working full time and most of my quilts take me at least weeks, if not months, to finish. However, deadlines can be very motivating, so 9 days after the fabric arrived in the mail, I had it finished and quickly got it ready and put the finished quilt back in the mail. But I didn't take a picture of it. This quilt was inspired by a man who visited our church to speak. His shirt had an orange peel-like design, with the button placket in a different print altogether, making for a really stark division between the two sides of the shirt. I hardly heard a word he said because I kept staring at his shirt and trying to envision how I could turn it into a quilt design! All of the fabric for this quilt was provided by the Me + You division of Hoffman Fabrics. The background is one of their Indah solids and the prints are all from the Indah batiks line. I have to say I loved the feel of the fabrics and I will definitely want to use them again. Thanks to this quilt, I now know I can make a quilt in 9 days, though I hope not to make a habit of it. Congratulations!! I love the story behind this quilt! You really make me want to start submitting more designs to magazines! How many magazine appearances have you had? Do you keep a portfolio of them? I love this! I was laughing as I read your story because I too have been distracted by a good shirt pattern! 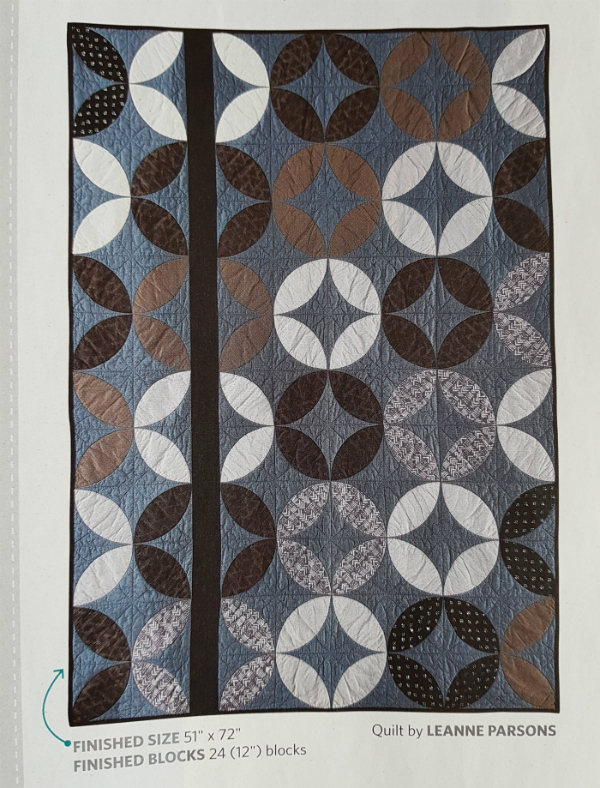 It's a beautiful quilt and congrats on being featured in Quilty. I'm so glad you mentioned it because I had forgotten that they were publishing again. So, thank you! Congrats on having your quilt published! It is beautiful. These fabrics give it a masculine feel. woo hoo for the publication! That's awesome. Great masculine quilt! Congrats on the magazine! Yes, deadlines do have a way of motivating us! Your quilt turned out gorgeous. Its always interesting finding out where inspiration comes from! Congrats! A finish in nine days, that's crazy :) Love those orange peels and the story behind the inspiration. Congrats on the publication and getting it finished so quickly. Your quilt is beautiful. Leanne that is amazing! Great quilt and congrats on the publication. I might be having to get one done just as quickly in my very near future....yikes. Beautiful quilt, Leanne, and congratulations on the media exposure!